Are you looking for a movie with complex cinematic production, lavish scenic locations, supernatural heroes, explosive stunts, sci-fi twists and special effects? 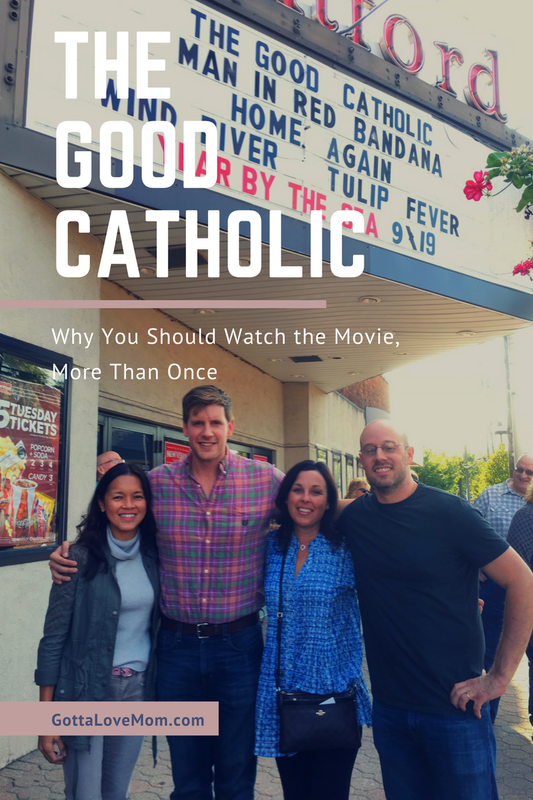 If you are, then the movie, "The Good Catholic ", is not what you're looking for. However, it is something you should reconsider, because it's a feel-good movie that will make you think, ponder and chuckle. You're probably thinking, "it's probably preachy since it's a Catholic movie." First of all, it's not preachy at all, and secondly, it is not a Catholic movie. In celebration of my birthday, my friend invited me to go see a movie. I suggested that we see "The Good Catholic " which was recommended by another friend of ours. It's playing until September 14th in our town, Cranford, which is known as the Center of the Universe. Today happened to be a special showing followed by a Q&A with the actor and the director. "The Good Catholic ", is an independent film that draws the attention of the viewers with story lines that capture the human emotion and dialogues that are compelling and witty. The Good Catholic is that one independent film you would want to watch, more than once. It is a story about a young priest who has his set daily routine until he stumbled into a crossroad. In his simplicity and innocence, he believes that his purpose in life is to be a Man of God although certain uncertainties about his faith, and an encounter with a woman at his Friday night confessional shift, casted a doubt. It is a straight-forward film that makes you feel like you’re sitting on your favorite couch reading a book. You get drawn to every dialogue and on how the characters interact and evolve. At times, you'd wish you could flip the pages and re-read the conversations. "The Good Catholic " is loosely based on writer-director Paul Schoulberg’s personal experience. His father was a priest, and his mother was a nun. The movie centers on the conflict experienced by the young priest, Father Daniel, played by the adorably telegenic, charismatic and angelic, Zachary Spicer. Father Daniel lives in the church rectory together with two priests with totally opposite personalities: the straight-faced, ever- serious, wiser and by-the-book, Father Victor (Danny Glover) and the fun-loving, carb-loading and comedic, Father Ollie (John C. McGinley). His routine was interrupted by his interaction with an unconventional woman, Jane (Wrenn Schmidt). A few of my favorite scenes from the movie occur at the rectory’s dining room and at the altar where the 3 priests rehearse their homilies. Here’s one of the excerpts from the movie when Father Ollie talks about compassion. I grew up with very Catholic families. I have uncles, aunts and cousins who are priests and nuns. My father was an ex-seminarian when he met my mother. From what I was told, priesthood is a vocation that requires dedication, true faith, compassion and strict adherence to their vows of obedience, poverty and chastity. But all these all fall under one rule of God: LOVE. So, why should you watch the movie, "The Good Catholic "? The movie reminds you of what makes life beautiful, the simple things that matter and the reason why our heart beats the way it does. It’s a film about love, faith and simple pleasures. The film requires that you focus on the conversation and not to be distracted with lavish production tactics - a good detox cure for multi-tasking ADHD mothers like me. The acting and the script will make you glued to the screen. Friends support each other. Friends help each other shine. Friends empower one another. One of the film’s Associate Producers is a friend of mine, who’s been very supportive of the community. And today, it's our turn to give back. Congratulations, Marie Forrestal! "The Good Catholic " is an independent film produced by people like you and me: people who had a vision, a dream, a story to share - and were given a chance to shine; a community of friends who believed and had the courage and conviction to make their dreams happen. As a mother of a son who's in the arts, documentation and film making, I know the sweat and tears that go into making something magical out of a creative idea. Supporting independent films is like that week in November when we all “BUY LOCAL” to support the Small Business owners. We have to support dreamers and doers like Paul Schoulberg and Zachary Spicer. To Paul and Zachary, congratulations! You created something magical and powerful. So, grab that pumpkin-spice latte and invite your book club friends, your multi-media journalism students, your girlfriends or your husband to go watch the movie, "The Good Catholic " and then go to iTunes or Amazon and buy/download the movie so you can watch it again and again until you memorize the lines. "The Good Catholic ", Best Feature Film Winner at the Santa Barbara International Film Festival and Best Screenplay Winner at Milan International Film Festival, is available in select theatres, iTunes and Amazon.